Peter Dinklage is an American film, television and theater actor. Since his breakout role in the 2003 film The Station Agent, he has acted in Elf, Underdog, Find Me Guilty, the 2007 film Death at a Funeral and its 2010 remake, and The Chronicles of Narnia: Prince Caspian. Since 2011 he has starred in the HBO series Game of Thrones, based on George R.R. Martin's series of novels A Song of Ice and Fire, which earned him the Emmy Award for Outstanding Supporting Actor in a Drama Series. Dinklage was born with achondroplasia, causing dwarfism. His height is 4'5" . Dinklage was born in Morristown, New Jersey, the son of Diane, an elementary school music teacher, and John Carl Dinklage, a retired insurance salesman. He grew up in Mendham Township, New Jersey. Dinklage graduated from Delbarton School in Morristown in 1987, pursuing his future in acting, and graduated from Bennington College in 1991. Dinklage made his feature debut in the 1995 cult art house film Living in Oblivion playing the role of a frustrated dwarf actor complaining about his clichéd part. Dinklage's breakout role was in the 2003 award-winning film The Station Agent, his first mainstream appearance. He received Independent Spirit and Screen Actors Guild Award nominations for Best Actor for his performance in that film. That same year, he appeared in the direct-to-DVD movie Tiptoes with Gary Oldman. As well as appearing in films, Dinklage has starred multiple times in off-Broadway productions. In Elf, Dinklage played a pretentious children's author who beats up Will Ferrell's character after he is unintentionally insulted. In 2005, Dinklage starred in the short-lived CBS science fiction series Threshold and appeared in the Michael Showalter comedy The Baxter as a wedding planner. In 2006, Dinklage appeared in Sidney Lumet's courtroom drama, Find Me Guilty, and in episodes of Nip/Tuck. He played himself in one episode of the HBO television series Entourage and was featured on NBC's 30 Rock. Dinklage also had a role in the 2007 British Death at a Funeral. He plays the same role in the American remake of the film. That same year, he played the villanous Simon Bar Sinister in Underdog. 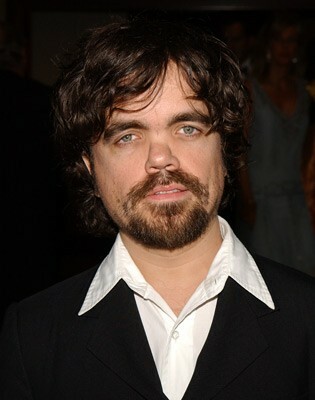 Dinklage was chosen by director Andrew Adamson for the role of Trumpkin in the 2008 film Prince Caspian although film critic Bill Gibron described his role as a "cutesy stereotype has tried to avoid." Dinklage starred in the thriller Knights of Badassdom, directed by Joe Lynch. Dinklage plays Tyrion Lannister in HBO's Game of Thrones, an adaptation of author George R. R. Martin's A Song of Ice and Fire series. His performance has received widespread praise, highlighted by his receipt of the Emmy Award for Outstanding Supporting Actor in a Drama Series in 2011. Dinklage married Erica Schmidt, a theatre director, in 2005. As of 2011, they are expecting their first child. He is of German and Irish descent. When asked about his height in a 2003 interview, he said: "When I was younger, definitely, I let it get to me. As an adolescent, I was bitter and angry and I definitely put up these walls. But the older you get, you realize you just have to have a sense of humor. You just know that it's not your problem. It's theirs." Both of his parents were of average height, as is his brother, Jonathan. Whole or part of the information contained in this card come from the Wikipedia article "Peter Dinklage", licensed under CC-BY-SA full list of contributors here.